Most track and field athletes spend a lifetime trying to accomplish something as historic as setting a new national record. 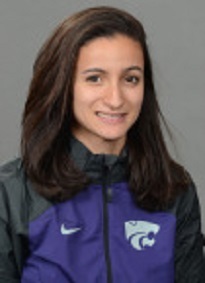 At just 19 years old, Kansas State University freshman Rhizlane Siba already owns two of Morocco’s national records in the high jump. And she’s only getting better. Born and raised in a Muslim family in Morocco’s capital city of Rabat, Siba has seen a lot of the world in her nascent athletic career. She took up the sport in Africa, she’s trained in Europe, competed in the Middle East, and now attends college in the United States. Siba won gold medals at the Arab Athletics Championships (2013), the African Championships (2014) and the African Junior Championships (2013). At the World Youth Championships in 2013, she claimed a bronze medal. This year, while dealing with an ankle injury and working out changes in her technique, she finished second at the Arab Championships in Bahrain and third at the African Junior Championships in Ethiopia. 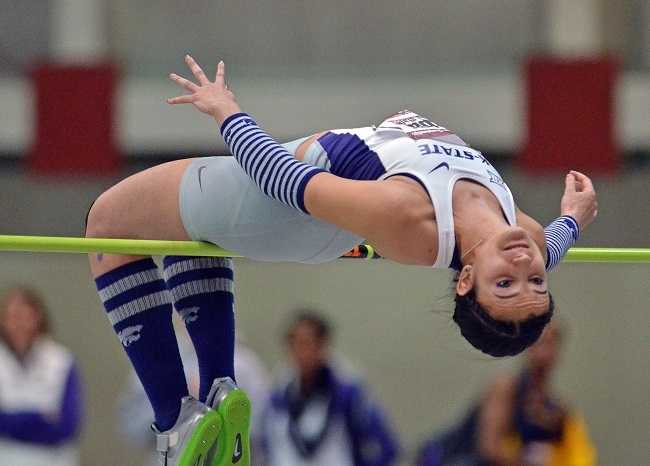 At the Big 12 Conference Indoor Championship this past February, Siba finished fifth with a clearance of 1.76 meters. This weekend, Siba will compete at the Big 12 Outdoor Championship in Ames, Iowa. If she comes close to her PR mark, she should be able to earn a spot on the podium. UMMAH SPORTS: When you first started in track and field, what led you to choose high jump as your specialty? RHIZLANE SIBA: I started track at 12 years old. Everybody was choosing to run, but I (eventually) chose high jump because I beat all of the seniors in jumping at my high school. I’m always thinking about long-term, and with the high jump I knew I’d have a better chance at getting a college scholarship. It makes you automatically unique in a way, because most African track stars known to the mainstream audience are distance runners. Throwers, jumpers and sprinters from Africa get overlooked. I want to show people that in Africa it’s not only about racing. When I came here (to the U.S.), people would ask, “Where are you from?” When I’d say I’m from Morocco and that I was on the track team, they’d be like, “What are you running?” thinking I’m a distance runner. I want to break that stereotype about African athletes. We’re good at other things; we’re just going to have to prove it. Because distance running is so much more popular in Africa, was it hard for you to get attention locally as a jumper? Being a high jumper has been a struggle. In my last year of high school, I didn’t have anyone consistently coaching me — I had three or four different coaches. There were some competitions that I couldn’t go to with the national team because they’d saved all of the team spots for runners. We didn’t have a lot of jumpers in Morocco when I started. The Moroccan federation helped me go to some training camps in Germany, France and Eastern Europe. I could work on technique (in Europe) more than I could back home. Do you feel like you’re still learning how to jump to the best of our ability? I’ve already had to change my whole technique since I’ve started college. The way American athletes jump is completely different. Americans use more strength. In Europe, it’s based more on a certain technique. I’ve had to lift a lot of weights to get in shape for the American style. This year has been a transition year. I’d rather have that now, with this being an off year, so I’ll be prepared and really strong for the Olympics in 2016. Were you always a natural leaper? What kind of sports were you involved in before track? My mother always occupied our free time with sports, from martial arts to classic dancing to swimming. Track was the last thing I would think of, but I was pretty much very athletic and super active as a child. What is your typical day like during track season? A normal day would be to wake up at 6:30 a.m., go weight lifting at 7, have breakfast and usually get done by 9, then run to class from 10 a.m. to 4 p.m. and head back to practice Around 4:30 p.m. Have dinner around 6, go to study table — which is reserved for student-athletes with helpful tutors — and get back home around 9:30 p.m. Does your routine change during Ramadan? Yeah, it does. Fasting is not something I can get rid of — I am really dedicated to my religion — so I do my best to practice before eating, insha’Allah. Or before an event starts, sometimes I can eat something. I’m going back to Morocco this year; NCAA nationals finishes on the 13th (of June), I’ll be on a plane on the 16th, and be in Morocco for the beginning of Ramadan. Next year will be really hard because I’ll be staying in the U.S., but my mother will be coming to America so she can help me out. What do you do — or what do you tell yourself — before each jump in a competition? I’ll use a finger on my right hand to see which way the wind is going. Sometimes I’ll touch my shoulder and touch my hip. Those are the places I sometimes forget to activate when I’m jumping, so it’s like a reminder. Are there other high jumpers on the pro level that you enjoy watching? Mutaz Essa Barshim from Qatar. He’s a really good friend of mine. He’s another Arabic high jumper that came to the world and nobody knew who he was, and he’s shown them how good we can be. His younger brother (Muamer Essa Barshim) is a high jumper, too. I also like watching (K-State alum and Olympic silver medalist) Erik Kynard. He’s proof that if you have the basics, you can add whatever you want. You don’t have to be identical to everyone else. What was it like moving from a Muslim-majority country to the U.S.? It pushed me to know more about my religion. When I moved to America, I was asked a lot of questions about my religion, and a lot of questions that were always just obvious to me and I never had to explain before. People had a confused curiosity. I’d get asked questions like, “Does a hijab have to be black?” I needed to be able to explain things in a rational way, so I had to learn more. What was the biggest adjustment you had to make? There was a big culture shock. Here in Kansas, I didn’t feel like, “Oh, look at the big buildings.” In that way, it felt a little more like home. But some of the other stuff I experienced, like some racial things, I hadn’t experienced at home. In America, everything is Black and White. People would find out I’m from Africa and they’d ask, “Why are you White?” In Morocco, you experience so many other cultures than in America. It’s just different. Over here, all of my Christian friends eat pork. But in Africa and in Europe, they don’t do that. I’ve seen the difference when people allow themselves to do things that their religion says they’re not allowed to do. Me? I’m like, “No, that’s forbidden. Why would I want to try it? Why would I even want to do it?” If something’s not good for my health and not good for me, and is not going to benefit me at all, why do it? I was feeling lonely at first, but when you’re physically lonely, having faith in God helps you through a lot of things. I think it’s thanks to that faith that I’m still in America and didn’t decide to go back. I thank God that I am Muslim and have that faith; it gives me power. Have you been able to find a Muslim community in Kansas? Yes, we have a mosque in Manhattan that I’ve been to. It’s a small community, but it’s present. We have a lot of students from the Middle East and from places like India, and the school has a Muslim Student Association. You said you were thinking of going to college on a track scholarship well in advance. Was coming to America always the plan, or would you have gone to school in another country? My plan was not to stay in Morocco. When I was training in France, I thought about attending university in France. The other choice was going to an American university. My mother was like, “America is really far.” She said I could go to Germany, and even if I didn’t make it in sports I’d still have a scholarship to go to school. But when I got answers from the universities in America for track, I wanted to go. Why did you pick Kansas State? They have great facilities. They recently had an Olympic high jumper in Erik Kynard. And they had been more insistent about me coming to this school. They have a great team here and great high jumpers. What are your plans moving forward in this sport? I want to compete in two Olympics representing Morocco. After that, I want to coach. Back in Morocco, they really don’t have the concept of being a student-athlete; people think if you go after higher education, then you have to give up sports. But I wasn’t ready to do that after winning bronze at the World Youth Championships. I want to introduce a student-athlete program in Morocco. UPDATE: Rhizlane Siba tied for sixth place in the high jump at the Big 12 Outdoor Championship with a clearance of 1.76 meters. She helped Kansas State win second place in the women’s team competition.